What is a Writing Manual? Writing manuals teach a student how to form letters and write a particular style of writing or hand. 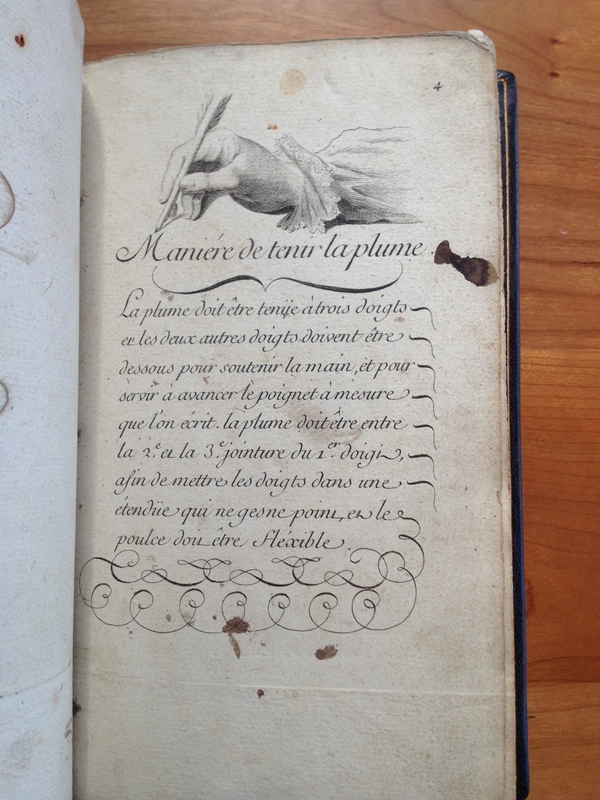 Often, a writing manual discussed ink recipes, paper selection, how to cut a quill into a pen and how to hold it. They came into widespread use in the first quarter of the 16th century as a way to teach students how to be scribes. The first writing book to be published was written by Ludovico degli Arrighi’s La Operina and was printed from a text cut in wood. Books with text cut in wood had been available prior to the invention of moveable type, but those books were meant to be read for the text only. 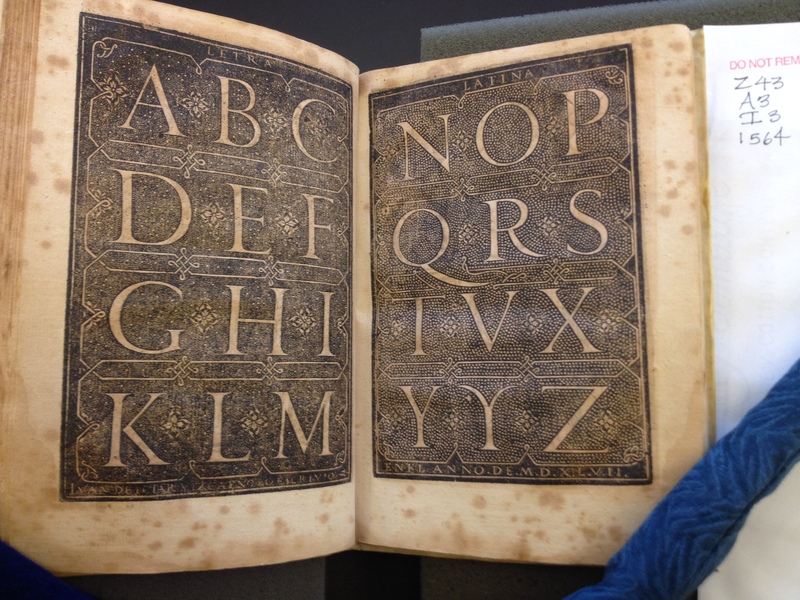 With metal type, there was no way to illustrate how to form letters, and Arrighi had his text engraved in wood and printed from these blocks of text. Writing manuals quickly became Renaissance best sellers. Writing manuals were popular books because they showed how to write specific styles and they were designed to be beautiful books. Because the text was cut in wood (later engraved in copper), the blocks were saved for later printing and often printed by different printers. Their useful life could extend beyond a century. This gave rise to a dizzying number of variants and titles. 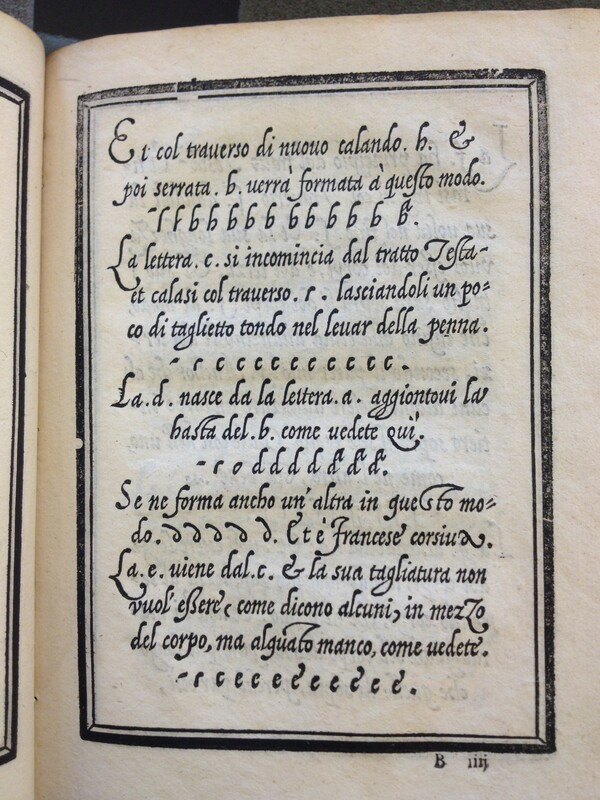 Giovanni Batista Palatino composed and published Libro nuovo d’imparare a scrivener in 1540. As you can see from the title, the advertiser’s favorite “New and Improved” marketing technique was born. 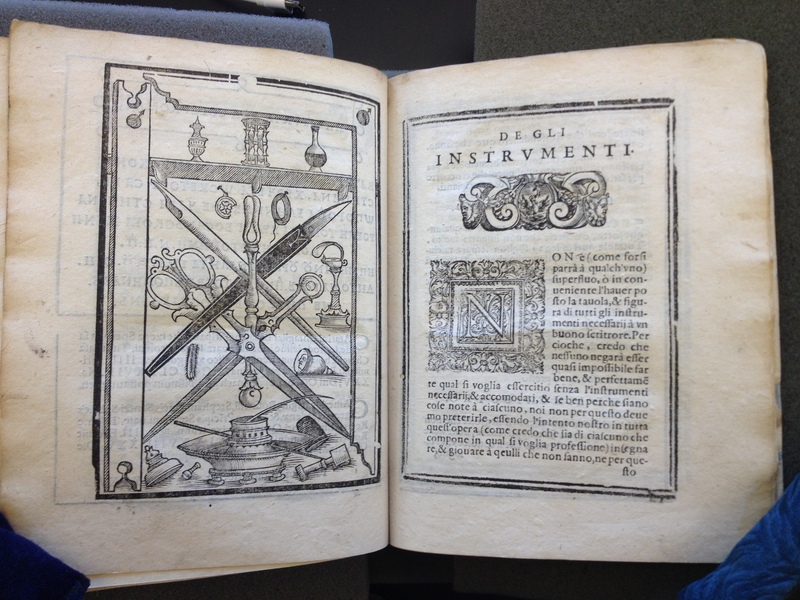 Julie L. Melby at Princeton’s Graphic Arts collection does a fine job of writing about these books in Palatino’s Tools of Writing. 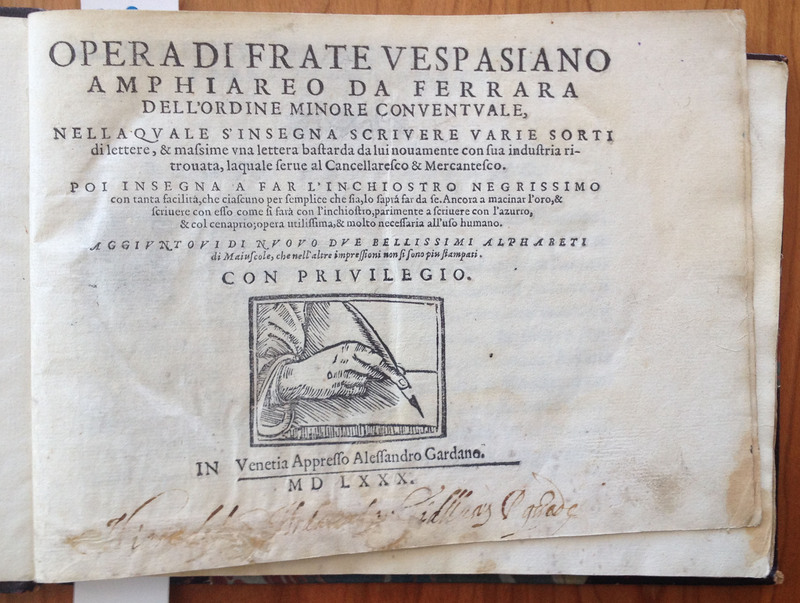 The Bancroft Library’s copy Compendio del gran volvme dell’art del bene & leggiadramente scriuere tutte le forti di lettere e caratteri… from 1588, shows a previous owner’s attempt at writing out the text in the margin. 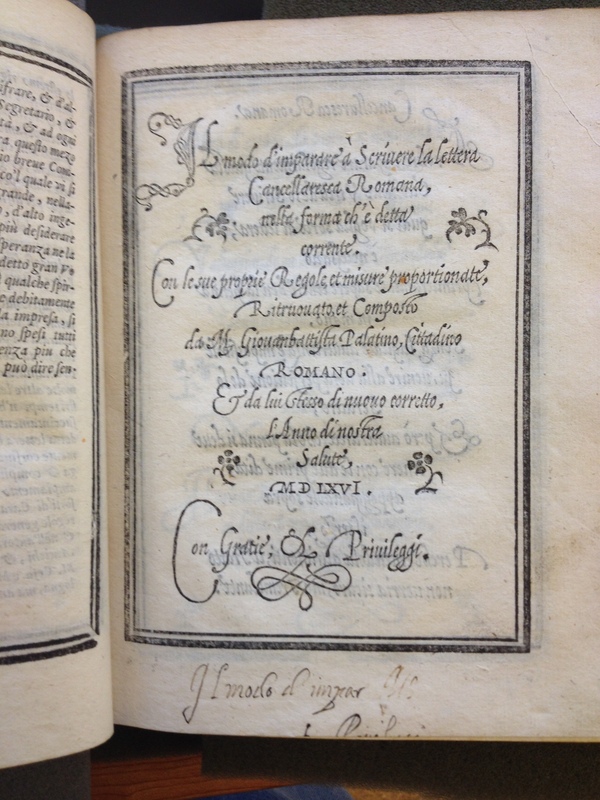 1588 Palatino @Bancroft Library. Student has copied part of the text in the lower margin. Where are these books located & how do I find them? The heavyweights in the history of writing have written about these books for a century. People like Stanley Morison, Alfred Fairbank, James Wardrop and Nicholas Barker dove deep into this subject. These guys were interested in how handwriting influenced type design and how these books were made and printed because they were primarily illustrated books about letterforms. Illustrated in wood or metal, the text might be all cut (therefore illustrated, not typeset) or an admixture of typographic and xylographic (woodcut) or copperplate. If you’re really interested in this, you can get lost in the subject and never even see one of the actual books. There is so much literature in both books and journals that you could spend a year reading and know only a little. Because I have spent a lot of time looking at these books all over the US, I’m familiar with their location and know where the major collections are. Making a census of books by location will assist scholars in their research. Without this type of finding aid, it is difficult to know what is in an institution since items are not cataloged in a way that they can be found online. I invite readers to suggest institutions with writing manuals and copybooks that I may have missed. I am drawing a map that will give you a view of where I’ll be headed – and loosely, when. Then you can follow along, and if I discover more institutions along the way I can visit them. The trip will begin in the Bay Area and head in a counter-clockwise direction around the US and into Canada. Leaving the locals till last, I’ll give you a quick highlight: Huntington Library, Harry Ransom Center, UTAustin, Library of Congress, Folger Shakespreare Library, Scranton, Philadelphia, Princeton, New York Public Library, Columbia University, Yale, American Antiquarian Society, Harvard, Toronto, Chicago, Iowa City, and home to the target-rich environment of the Bay Area. Locally, the Bancroft Library at UCBerkeley has a number of items, San Francisco Public Library, Stanford and the Letterform Archive. You’ll be hearing about this new institution as my friend Rob Saunders has turned his private collection of material about letterforms into a nonprofit organization that offers digital images of the collection as well as on-site study for type designers, calligraphers, lettering artists and historians. I’ve got a few things to prepare for my Indiegogo launch on June 19, and will be back in a day or two with more. 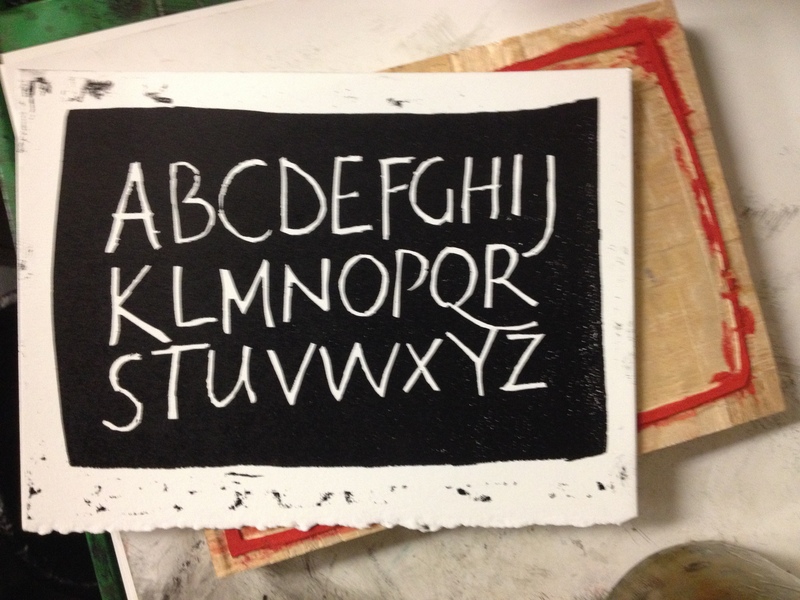 Here’s a few woodblock items I’ve done and printed letterpress. Woodblock, on press with print pulled away from block. 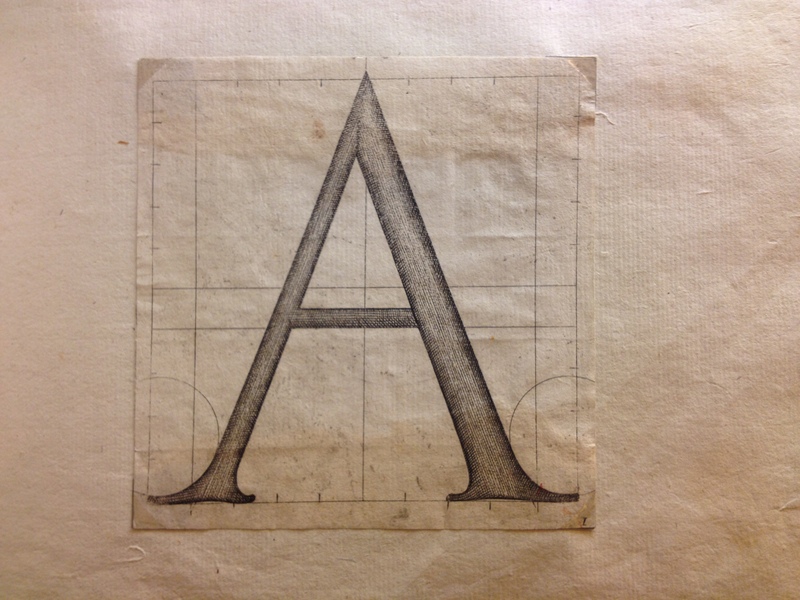 Woodblock alphabet, cut in reverse. 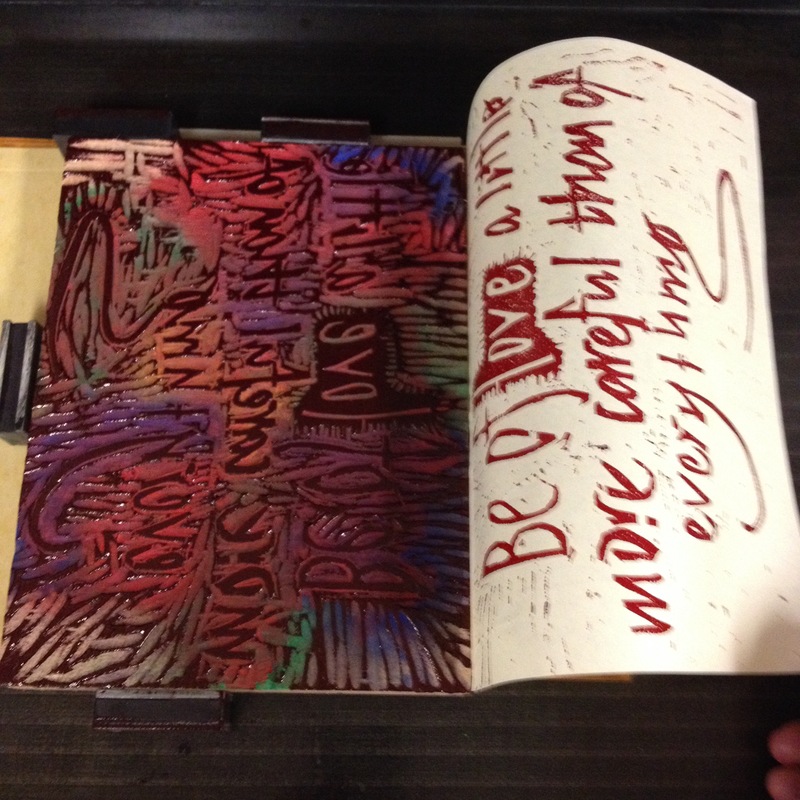 Printed letterpress. My name is Nicholas Yeager, I’m a scholar, librarian, motorcyclist and scribe. You know what the first three are, but what’s a scribe? Every time you write something with a pen, you are inscribing the paper (or other substrate) with your handwriting. A scribe may be called lettering artist or calligrapher these days but there was a time when the only way to record information was by writing it down. And the people that did that were called scribes. Motoscribendi will chronicle my travels – yes, by motorcycle – to major collections of old writing manuals, copybooks and lettering instruction manuals at libraries across North America. These visits will enable me to develop a catalog of representative writing manuals that will help people locate these scattered resources. (Despite a resurgence in type design and lettering art, there’s still no centralized way to find them.) The trip will also help me produce a modern writing manual that pays homage to this type of book. If Gutenberg were trying to destroy the scribal industry by inventing printing back in the 15th century, he blew it. Because one of the unintended consequences of printing was to establish a permanent place for calligraphers and scribes. Printing didn’t eliminate scribes, it created even more need for scribes to record legal, commercial, theological and medical correspondence. And printing allowed writing masters a method of recording their exact lettering instructions to teach students far from their writing schools. Thirty-nine years ago I began to study calligraphy and the history of the book. With Patti Downing, I began a manuscript study group at the Newberry Library in Chicago. We studied various hands and book design, early printing and the large collection of writing manuals that are housed at the Newberry. My interest in these books stayed with me and I continued to study them at the Harry Ransom Center, Columbia University’s Rare Book Room and as a librarian at New York Public Library. Along with this I practiced calligraphy and graphic design, wrote about and edited calligraphic and book art publications and studied descriptive bibliography and the history of printing. 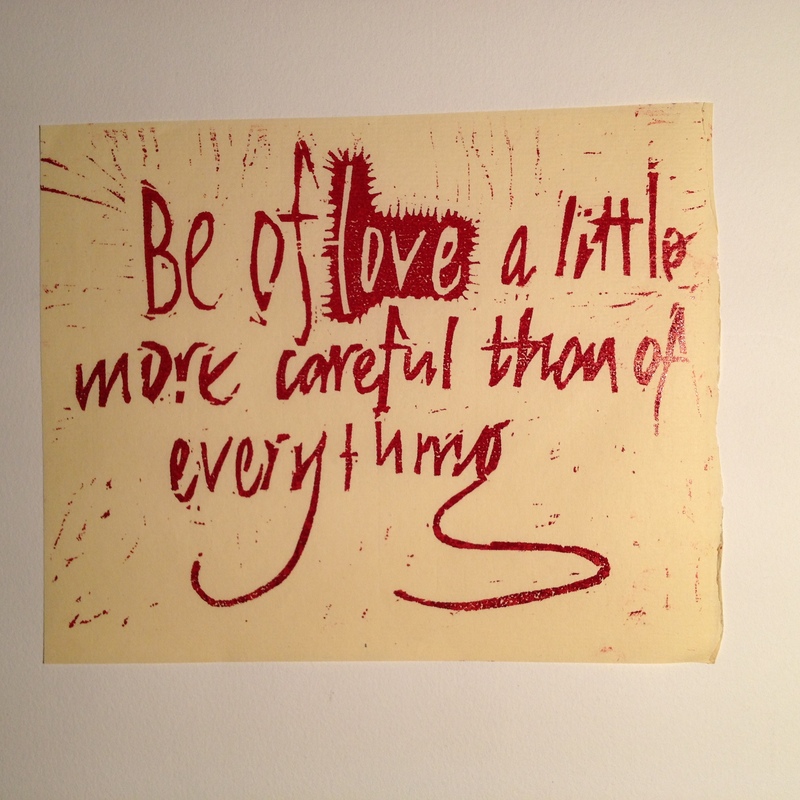 I teach calligraphy and lettering and make pieces for shows and for sale. While I moved around the country, I rode motorcycles for most of that time, having begun riding when I was 13. My love of long-distance motorcycling didn’t have an opportunity to develop until I was in my 40s and has since been a major component of my life. I have traveled to library trade shows, exhibitions and workshops on my motorcycle. Riding lets me discover what lies between the major cities I travel to – and to be fully present in all those places. It gives me the same feeling of immersion and discovery I get from studying a writing manual. In both cases, a lot of the most interesting stuff is hidden in the finest details. It needs to be experienced up close and in person. My trip will start in mid July. I hope you’ll come along especially if you’re new to these books and their history. I’ll discuss their design, printing and collecting history as well as my talks with historians, librarians, printers and other book arts practitioners across North America.